Audie Leon Murphy (June 20, 1926 – May 28, 1971) was an American soldier in World War II, who later became an actor, appearing in 44 American films. He also found success as a country music composer. In 27 months of combat action in World War II, Murphy became the most decorated United States combat soldier in United States military history. He received the Medal of Honor, the U.S. military's highest award for valor, along with 32 additional U.S. medals, five from France, and one from Belgium. Murphy had a successful movie career, including the extremely popular To Hell and Back (1955), based on his memoir of the same name (1949), and starred in 33 Hollywood Westerns. He died at the age of 44 in an airplane crash in 1971 on Memorial Day weekend after completing his last film A Time for Dying. He was interred, with full military honors, in Arlington National Cemetery. His gravesite is the second most-visited, after that of President John F. Kennedy. He was born in Kingston, Texas, to Emmett Berry and Josie Bell Murphy (née Killian) who was of Irish descent. His parents were poor sharecroppers, and he grew up on farms between Farmersville and Greenville, as well as near Celeste, Texas (Hunt County). Murphy was the sixth of twelve children, nine of whom survived until the age of eighteen. He went to school in Celeste until the eighth grade, when he dropped out to help support his family, working for a dollar a day, plowing and picking cotton. He became very skilled with a rifle, hunting small game to help feed the family. Murphy also worked at a combination general store/garage and filling station in Greenville, Texas. At age 16 he was working in a radio repair shop when his mother died on May 23, 1941. His father had abandoned them some years earlier and as a result of his mother's death his three youngest siblings were place in an orphanage (he reclaimed them after World War II). After the attack on Pearl Harbor on December 7, 1941, Murphy (then just 16 years old) tried to enlist in the military, but the services rejected him for being underage. In June 1942, shortly after his 17th birthday Murphy was accepted into the United States Army at Greenville, after being turned down by the Marines and the paratroopers for being too short (5'5"/1.65 m) and of slight build. His company commander tried to have him transferred to a cook and bakers' school because of his baby-faced youthfulness, but Murphy insisted on becoming a combat soldier. His wish was granted: after 13 weeks of basic training, he was sent to Fort Meade, Maryland for advanced infantry training. Murphy still had to "fight the system" to get overseas and into combat. His persistence paid off in early 1943 when he was shipped out to Casablanca, Morocco as a replacement in Company B, 1st Battalion, 15th Infantry Regiment (United States), 3rd Infantry Division. Murphy saw no action in Africa, but instead participated in extensive training maneuvers along with the rest of the 3rd Division. His combat initiation finally came when he took part in the liberation of Sicily on July 10, 1943. Shortly after arriving, Murphy was promoted to corporal after killing two Italian officers as they tried to escape on horseback. He contracted malaria while in Sicily, an illness which put him in the hospital several times during his Army years. After Sicily was secured from the Germans, the 3rd Division invaded the Italian mainland, landing near Salerno in September 1943. While leading a night patrol, Murphy and his men ran into German soldiers but fought their way out of an ambush, taking cover in a rock quarry. The German command sent a squad of soldiers in but they were stopped by intense machine gun and rifle fire: Three German soldiers were killed and several others captured. For his actions at Salerno, Murphy was promoted to sergeant. Murphy distinguished himself in combat on many occasions while in Italy earning several promotions and decorations for valor. Following its participation in the Italian campaign, the 3rd Division invaded Southern France on August 15, 1944 (Operation Anvil-Dragoon). Shortly thereafter, Murphy's best friend, Lattie Tipton, was killed while approaching a German soldier who was feigning surrender. Murphy went into a rage, and single-handedly wiped out the German machine gun crew which had just killed his friend. He then used the German machine gun and grenades to destroy several other nearby enemy positions. For this act, Murphy received the Distinguished Service Cross (second only to the Medal of Honor). During seven weeks of fighting in that campaign in France, Murphy's division suffered 4,500 casualties. Just weeks later, he received two Silver Stars for further heroic actions. Murphy, by now a Staff Sergeant and holding the position of Platoon Sergeant, was eventually awarded a battlefield commission to Second Lieutenant, which elevated him to the Platoon Leader position. He was wounded in the hip by a sniper's ricocheting bullet 12 days after the promotion and spent ten weeks recuperating. Within days of returning to his unit, and still bandaged, he became Company Commander (January 25, 1945), and suffered further wounds from a mortar round which killed two others nearby. The next day, January 26, the battle at Holtzwihr (France) took place. Murphy sent all of his men to the rear while he held off the Germans until out of ammunition. He then proceeded to use an abandoned, burning tank destroyer's .50 caliber machine gun to cut into the German infantry at a distance, including one full squad of German infantry that had crawled in a ditch to within 100 feet of his position. Wounded in the leg during heavy fire, he continued this nearly single-handed battle for almost an hour. His focus on the battle before him stopped only when his telephone line to the artillery fire direction center was cut by either U.S. or German artillery. As his remaining men came forward, he quickly organized them to conduct a counter attack, which ultimately drove the enemy away from Holtzwihr. These actions earned Murphy the Medal of Honor. Murphy was then removed from the front lines and made a liaison officer; he was promoted to First Lieutenant on February 22, 1945. On June 2, 1945, Lt. Gen. Alexander Patch, commander of the U.S. Seventh Army, presented him with the Medal of Honor and Legion of Merit. The Legion of Merit was awarded for outstanding services with the 3rd Infantry Division during January 22, 1944 to February 18, 1945. On June 10, Murphy left Paris by plane, arriving in San Antonio, Texas four days later. Audie Murphy was credited with destroying six tanks in addition to killing over 240 German soldiers and wounding and capturing many others. By the end of World War II he was a legend within the 3rd Infantry Division. His principal U.S. decorations included the Medal of Honor, Distinguished Service Cross, two Silver Stars, the Legion of Merit, two Bronze Stars with Valor device, and three Purple Hearts. Murphy participated in campaigns in North Africa, Sicily, Italy, France and Germany, as denoted by his European-African-Middle Eastern Campaign Medal with one silver battle star (denoting five campaigns), four bronze battle stars, plus a bronze arrowhead representing his two amphibious assault landings at Sicily and southern France. During the French Campaign, Murphy was awarded two Presidential Citations, one from the 3rd Infantry Division, and one from the 15th Infantry Regiment during the Holtzwihr action. The French government awarded Murphy its highest award, the Legion of Honor (Grade of Chevalier). He also received two Croix de Guerre medals from France and the Croix de Guerre 1940 Palm from Belgium. In addition, Murphy was awarded the Combat Infantryman Badge. He spent 29 months overseas and just under two years in combat with the 3rd Infantry Division, all before he turned 21. In early June 1945, one month after Germany's surrender, he returned from Europe to a hero's welcome in his home state of Texas, where he was showered with parades, banquets, and speeches. Murphy was discharged from active duty with the U.S. Army as a First Lieutenant, at Fort Sam Houston in San Antonio, Texas on August 17, 1945, and discharged from the U.S. Army on September 21, 1945. He gained nationwide recognition, appearing on the cover of the July 16, 1945 issue of Life. After the Korean War broke out in June 1950, Murphy joined the 36th Infantry Division of the Texas National Guard, but it was not called up for combat duty. By the time he left the Guard in 1966, Murphy had attained the rank of Major. After his return from the war Murphy suffered from post-traumatic stress disorder (PTSD). He was plagued by insomnia, bouts of depression, and nightmares related to his numerous battles. His first wife, Wanda Hendrix, often talked of his struggle with this condition, even claiming that he had at one time held her at gunpoint. For a time during the mid-1960s, he became dependent on doctor-prescribed sleeping pills. When he recognized that he had become addicted to the drug, he locked himself in a motel room where he took himself off the pills, going through withdrawal for a week. Always an advocate of the needs of America's military veterans, Murphy eventually broke the taboo about publicly discussing war-related mental conditions. In an effort to draw attention to the problems of returning Korean and Vietnam War veterans, Murphy spoke out candidly about his own problems with PTSD, known then and during World War II as "battle fatigue" and also commonly known as "shell shock." He called on the United States government to give increased consideration and study to the emotional impact that combat experiences have on veterans, and to extend health care benefits to address PTSD and other mental-health problems suffered by returning war veterans. Murphy married actress Wanda Hendrix in 1949; they were divorced in 1951. He then married former airline stewardess Pamela Archer who was an Army nurse, by whom he had two children: Terrance Michael "Terry" Murphy (born 1952) and James Shannon "Skipper" Murphy (born 1954). They were named for two of his most respected friends, Terry Hunt and James "Skipper" Cherry, respectively. Audie became a successful actor, rancher, and businessman, breeding and raising quarter horses. He owned ranches in Texas, Tucson, Arizona and Perris, California. In 1955, Murphy became interested in Freemasonry. He was encouraged by his close friend, Texas theater owner Skipper Cherry, to petition and join the Masonic Order in California. He returned to Texas to become a 32nd degree Scottish Rite Mason and to join the Shriners. He was active in various Masonic events and was a member in good standing for the rest of his life. After seeing Murphy's photo on the cover of the July 16 edition of Life Magazine actor James Cagney invited Murphy to Hollywood in September 1945. Despite Cagney's expectations, the next few years in California were difficult for Murphy. He became disillusioned by the lack of work, was frequently broke, and slept on the floor of a gymnasium owned by his friend Terry Hunt, whom Murphy later named a son after. 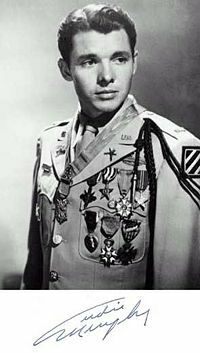 Audie Murphy's acting career did not happen overnight and Audie had a tough time breaking into starring roles. Although Audie had lines in his first two movies, Beyond Glory and Texas, Brooklyn and Heaven his roles were minor and his appearances brief. His third movie, Bad Boy became his first starring role. After returning home from World War II, Murphy bought a house in Farmersville, Texas for his oldest sister Corinne, her husband Poland Burns, and their three children. The idea was that Audie's three youngest siblings, Nadine, Billie, and Joe, who had been living in an orphanage since Murphy's mother's death, would also be able to live with Corinne and Poland and would become part of a family again. Unfortunately the situation didn't work out for long so Murphy came and picked them up. Joe and Nadine wanted to stay with him, but despite a lot of post-war publicity, his acting career had gone nowhere and he was finding it difficult to survive financially. The oldest Murphy brother, Buck, and his wife agreed to take Nadine, but Murphy didn't know what to do with Joe. He approached James "Skipper" Cherry, a Dallas theater owner who was involved with the Variety Clubs International Boy's Ranch, a 4,800 acre (19 km²) ranch near Copperas Cove, Texas who arranged for Joe to stay at the Boy's Ranch. He loved it there and Murphy was able to visit him, as well as Cherry, frequently. Variety Clubs was financing a film to be called Bad Boy to help promote the organization's work with troubled children and Cherry called Texas theater executive Paul Short, who was producing the film, to suggest that they consider giving Murphy a significant role in the movie. He looked good in the screen test, but the president of Allied Artists did not want to cast someone with so little acting experience in a major role. However, by this time, Cherry, Short, and the other Texas theater owners had decided that Audie Murphy was going to play the lead or they weren't financing the film. Their money talked and he was cast in the 1949 film and turned in such a fine performance that Hollywood finally recognized his talent. As a direct result of the film, Universal Studios signed Murphy to his first seven-year studio contract. After a few box-office hits there, the studio bosses gave Audie latitude in choosing his roles, as long as plenty of action was included in the scenarios. In 1949 Murphy's autobiography To Hell and Back became a national bestseller. In the book, ghostwritten by professional writer and friend David "Spec" McClure, Murphy modestly described some of his most heroic actions—without portraying himself as a hero. No mention of his many decorations appeared in the book. Instead, he chose to praise the skills, bravery, and dedication of the other soldiers in his platoon. Murphy played himself in the 1955 film version of his book, To Hell and Back. The film grossed almost ten million dollars during its initial theatrical release, and at the time became Universal's biggest hit of the studio's 43-year history. This movie held the record as the company's highest-grossing motion picture until 1975, when it was surpassed by Steven Spielberg's Jaws. In the movie Terry Murphy, who played younger brother Joe Preston Murphy (at age 4), is in fact Murphy's older son. Murphy was reluctant to star in To Hell and Back fearing that he was cashing in on his war experience - he even suggested that his role be played by Tony Curtis. The film was introduced by General Walter Bedell Smith, United States Army, Retired. During World War II, Smith had served as Chief of Staff to General Dwight D. Eisenhower. In 1953, distinguished director John Huston, whom Murphy regarded as a friend and mentor, starred him as the young soldier in his adaptation of Stephen Crane's The Red Badge of Courage (1953). He would again work with Huston in 1960s' The Unforgiven. All told, during his heyday, Murphy worked with some of the era's most prominent stars including James Stewart, Broderick Crawford, and Audrey Hepburn. In the 25 years he spent in Hollywood, Audie Murphy made 44 feature films, 33 of them Westerns. He also appeared in several television shows. He starred in Whispering Smith, a short-lived TV series that aired on NBC in 1961. Murphy played the title character, a police detective in 1870s Denver. His films earned him close to $3 million in his 23 years as an actor. For his contribution to the motion picture industry, Audie Murphy has a star on the Hollywood Walk of Fame at 1601 Vine Street. In addition to motion picture acting, Murphy also became successful as a country music songwriter. Teaming up with such talented musicians and composers as Guy Mitchell, Jimmy Bryant, Scott Turner, Coy Ziegler, and Terri Eddleman. Murphy's songs were recorded and released by such performers as Dean Martin, Eddy Arnold, Charley Pride, Jimmy Bryant, Porter Waggoner, Jerry Wallace, Roy Clark, and Harry Nilsson. His two biggest hits were Shutters and Boards and When the Wind Blows in Chicago. Eddy Arnold recorded the latter for his 1983 RCA album, Last of the Love Song Singers. Just after noon on May 28, 1971 (during Memorial Day weekend), while on a business trip, and flying in bad weather with a pilot unqualified to fly on instruments, Murphy's private plane crashed into Brush Mountain, near Catawba, Virginia, some 20 miles west of Roanoke. The pilot, as well as Murphy and four other passengers, were killed. He was 44 years 11 months old. In 1974, a large granite memorial was erected near the crash site. He died shortly after completing what he hoped would be his comeback picture, A Time for Dying (1971), in which he played Jesse James. On June 7, 1971, Murphy was buried at Arlington National Cemetery with a full-honors ceremony. The official U.S. representative at the ceremony was the decorated World War II veteran and future President George H. W. Bush. Murphy's gravesite is in Section 46, located across Memorial Drive from the Amphitheater. A special flagstone walkway was later constructed to accommodate the large number of people who stop to pay their respects. It is the second most-visited gravesite, after that of President John F. Kennedy. 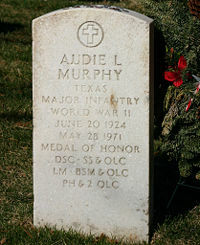 Audie L. Murphy, Texas. Major, Infantry, World War II. June 20, 1924 to May 28, 1971. Medal of Honor, DSC, SS & OLC, LM, BSM & OLC, PH & two OLC. An Oak Leaf Cluster signifies a subsequent award of the same decoration. First Lieutenant Audie Murphy was one of very few company-grade officers ever to be awarded the Legion of Merit. That decoration is usually awarded only to officers of the rank of lieutenant colonel and above. Murphy's passing in 1971 went almost unnoticed by the national media as it occurred at a time when the Vietnam War was at the center of a national debate that would prove to be quite divisive. That times were changing with regards to how military heroes were regarded in the United States is seen in the way Murphy's most decorated successor was treated by the nation. Col. Robert L. Howard became the most highly decorated serviceman in American military history after the Vietnam War, yet few of his countrymen know anything about him. Unlike Alvin York in World War I or Audie Murphy, Howard was not touted as a national hero by the media, he was given no ticker tape parade, and no Hollywood movie was made depicting his extraordinary exploits. Two years after his death, On November 17, 1973, the Audie L. Murphy Memorial Veterans Hospital in San Antonio, Texas, was named for him. In front of the Hospital there is a one-ton bronze, eight-foot-tall statue of Murphy, created by sculptress Jimilu Mason. He is dressed in battle fatigues holding a rifle with bayonet; inside the hospital, a museum depicts his life and contains items including his uniform, other clothing, books and pictures. In early 1986, the U.S. Army established the Sergeant Audie Murphy Club at Fort Hood, Texas. This elite membership group recognizes noncommissioned officers (sergeants) who have displayed the integrity, professionalism, commitment to mentoring subordinate soldiers, leadership abilities and personal ethics as exemplified by Audie L. Murphy. In 1994, the Sergeant Audie Murphy Club spread Army-wide, to all commands with installations retaining the selection process for their own NCOs. In 1996 the Texas Legislature officially declared his birthdate, June 20, as "Audie Murphy Day." U.S. Highway 69 North, from North Greenville city limits to Fannin County line was renamed "The Audie Murphy Memorial Highway." Also, in 1996 he was inducted posthumously into the Western Performers Hall of Fame at the National Cowboy & Western Heritage Museum in Oklahoma City, Oklahoma and to the Texas Country Music Hall of Fame. In 1999, then-Governor George W. Bush issued a proclamation declaring June 20 to officially be "Audie Murphy Day" in the State of Texas. The Audie Murphy/American Cotton Museum is located in Greenville, Texas and its goal is to educate the public about the history and impact of the cotton industry on the Northern Texas Blacklands and the United States. Audie Murphy, who grew up near Greenville, Texas was the son of cotton share croppers and his family is a part of the areas history. The museum opened a permanent exhibit dedicated to Audie Murphy. The exhibit is also featured during the Audie Murphy Day Celebration event which is generally held in June every year around the time of Audie Murphy's birthday. In 2000, Audie Murphy was honored with his portrait on a thirty-three cent United States postage stamp. There is also an Audie Murphy Middle School in Fort Hood, Texas, named in his honor. ↑ Audie Murphy's Military Award List Audiemurphy.com Retrieved July 1, 2008. ↑ Audie Murphy Imbd.com Retrieved July 1, 2008. ↑ Audie Leon Murphy Arlingtoncemetary.net Retrieved July 1, 2008. ↑ Daniel R. Champagne. 2002. Audie Murphy: One-Man Stand at Holtzwihr Historynet.com. Retrieved July 1, 2008. ↑ Audie Murphy's Military Award List Audiemurphy.com. Retrieved July 1, 2008. ↑ Denise Clark, 2006. Audie Murphy, Veterans & Post Traumatic Stress Disorder Associatedcontent.com. Retrieved July 1, 2008. ↑ Audie Murphy & Freemasonry Audiemurphy.com. Retrieved July 1, 2008. ↑ Audie Murphy's Movies Audiemurphy.com. Retrieved July 1, 2008. ↑ "Audie Murphy: Great American Hero," Biography, Greystone Communications, Inc. for A&E Television Networks, 1996 TV documentary. ↑ Songs Written By Audie Murphy Audiemurphy.com. Retrieved July 1, 2008. ↑ Audie Murphy Memorial Marker Audiemurphy.com. Retrieved July 1, 2008. ↑ Robert L. Howard Rlhtribute.com. Retrieved July 1, 2008. ↑ The Handbook of Texas Online Tshaonline.org. Retrieved July 1, 2008. ↑ The History of the Sergeant Audie Murphy Club Armystudyguide.com. Retrieved July 1, 2008. ↑ The Handbook of Texas Online Tshaonline.com. Retrieved July 1, 2008. ↑ Audie Murphy Day in Farmersville Audiemurphyday.com. Retrieved July 1, 2008. ↑ The Audie Murphy American Cotton Museum Cottonmuseum.com. Retrieved July 1, 2008. ↑ Audie's Stamp Audiemurphy.com. Retrieved July 1, 2008. Audie L. Murphy Memorial Web Site Audiemurphy.com. Brushy Mountain, VA Audie Murphy Killed In Plane Crash, June 1971 Www3.gendisasters.com. This page was last modified on 6 December 2016, at 00:13.